Where Can You Find America's Best SEMs? Right Next to America's Best Steakhouses, Of Course! By David Rodnitzky on 12/22/2009 in "Analytics Blogs"
I love those ads in in-flight magazines purportedly ranking the top steakhouses, seafood, Italian, or brewpub eateries in the US. The concept behind these ads is simple: get 10 restaurants to pay you to rank them in the top ten, then pay about 50% of what they pay you to the airlines – you make money, the airlines make money, and the restaurants get people coming through the doors. So what if the ad obscures the fact that this isn’t an actual ranking of quality, but rather a ranking of who pays the most to get in the ad, right? This “fake ranking” concept has now come to the SEM/SEO space. A company called “Top SEOs” is advertising on SearchEngineLand encouraging users to visit the site and see their rankings of the top SEOs, SEMs, local search, social media, and other experts. Of course, as the founder of an SEM agency, I was curious to see if somehow Top SEOs had included me in their rankings, but alas I wasn’t there. Moreover, the rankings start to smell suspicious immediately. Many of the top pay per click management companies were totally new to me, and the data being reported was outright strange. For example, coming in at #17 was Efficient Frontier, with revenue of between $3-$5M a year and over 100 employees. 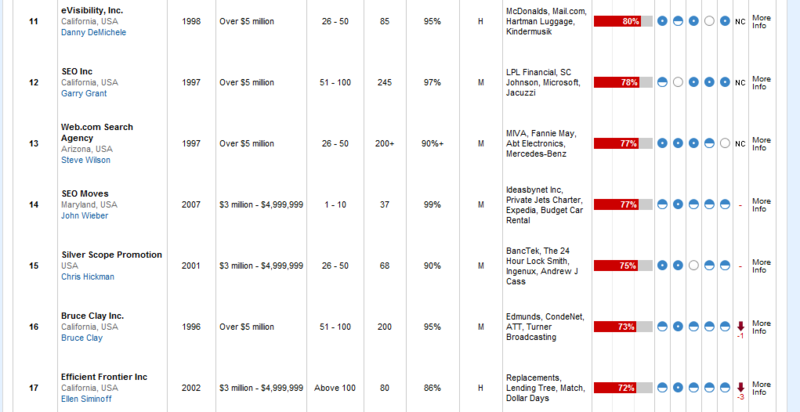 I think that might be their monthly revenue (oh, and they listed the CEO from two years ago). I then went to the advertising information page and found the answer I thought I would find: to be ranked, you need to buy a “membership” with Top SEOs – the minimum cost for a ranking for a year is $30,000! That’s a lot of payola, but I guess if hapless potential clients don’t know this is a paid ranking, it might also end up being a good investment. It’s always difficult to choose service providers and companies like Yelp and ChoiceVendor – both of whom rely on unsolicited reviews from actual consumers and businesses – are a good albeit still imperfect way to discern differences. TopSEOs, on the other hand, is no different than the flogs promoting Acai berry diets, or any fake news show/infomercial you see on late night television. The objective is not to be objective, and that’s something that the SEM industry should object to! 11 Responses to Where Can You Find America's Best SEMs? 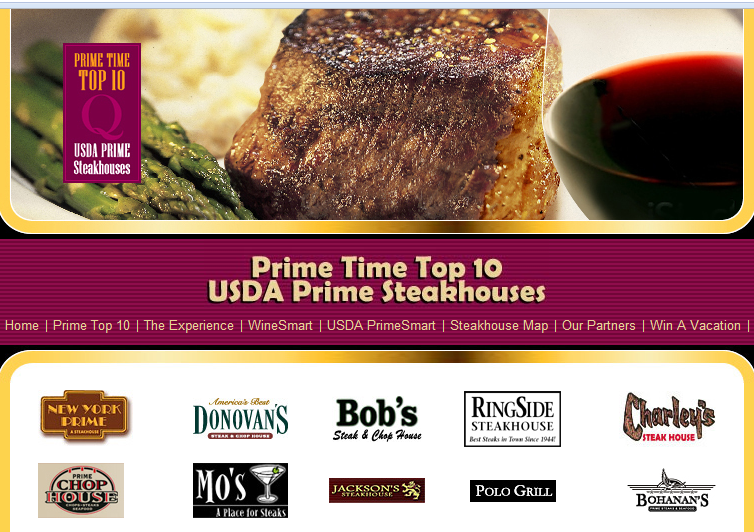 Right Next to America's Best Steakhouses, Of Course! Agree with you analysis David and thanks for putting in the thought. The SEM industry and SEO industry are full of complexity and it would be a worthwhile thing for a company to really dig in (more than the big analyst firms do today). Unfortunately, the information in TopSEOs within the PPC bid mgmt space is highly inaccurate. I know because I have worked in two of the companies on the list and do have direct knowledge. A plea to CEO and owner Jeev Trika – please reach out and really do the research before publicizing erroneous information.I randomly stumbled upon Jeev's personal blog and first post I read contained the following.."Really, what it all comes down to is being credible about your ideas so that they would be convinced about putting their money into your box." Thanks for the comment Chad (reminds me that we need to get together soon! )The sad thing is that consumers will be duped by this and lose faith in the SEM industry if they go with a "top" SEM who turns out to be anything but, and that hurts all of us! Brian, you are right that this isn't new, and advertising to some degree is always stretching the truth.The problem I have with this – and its the same problem the FTC has with flogs – is that it is representing itself as being objective and not advertising, when in fact it is 100% advertising. It is deliberately misleading consumers in my opinion. I have done a lot of research to find quality internet marketing firms without a whole lot of success. Every vendor that I have used that is on the TopSEOs list has provided exceptional service. They certainly have to be doing research to ensure that these companies are valid otherwise I'm sure their rankings would have been ignored a long time ago. According to the research I've done the site has been around since 2002. John, that may be true – I'm not implying that the firms are bad – but the fact that you have to pay to be ranked is problematic for many reasons: 1) the rankings are only open to people who pay the rankers money, so it is not an inclusive list; 2) there is an implicit promise of high rankings if you pay; 3) it is not disclosed to consumers that this is "for pay";Also, do you have any affiliation with TopSEOs? Just curious. David, I appreciate your opinion. But you did obtain those screenshots online at the TopSEOs site right? So obviously the information is out there and available for anyone to find. I certainly did my investigative research before going with the information posted. And the bottom line is that they connected me to good companies, and results are ultimately what I and I'm sure other businesses care about.In regard to your last question, I am not affiliated with TopSEOs. While I don't necessarily appreciate the implication I can understand the concern. This is such a great example of a search marketing local strategy!!! There's no better way to get business through the door then this. I work in the accounting department for a client of TopSeos. The company I work for have paid an exhorberent amount of money ($40,000 to date) for the services of TopSeos (I know because I pay the invoices). Up until now they were under the impression that the rankings they received on TopSeos were due to the fact they are an ethical company that provides an excellent service to their clients. My employers were approached recently by Jeev Trika who demanded that they pay more as he had other companies in the same field that he could sell the positions to for for a higher price. Well to say they were taken aback is a gross understatement as this means it is actually a bidding war for positions and not based on merit at all. I would like to point out that I am sure that many of the businesses listed on TopSeos will be equally unaware that this is case until they themselves are put in the same position. Jeev Trika is a very unpleasant and unproffessional man who has no interest in researching the sites he proposes to “rate” and his main objective is to line his own pockets. In a nutshell Topseos is a scam and should be avoided at all costs. Incidently my employers received very little business through topseos and the whole unpleasant episode has cost the company money. Avoid Avoid Avoid!! I am wondering what this is all about ?